Finding my passion, what a struggle! I’ve been thinking a lot about my next move. I mean, not literally, but figuratively – what is the next path I’m going to take? I’ve been searching for advice on finding and living your passion. I’ve been reading blogs like Tara Swiger’s, where she gives advice on making your personal business as YOU as it can be by following your North Star (basically your most important value). I haven’t taken her courses, but from what I gather, you decide on a value (or a few), write it down, and make all of your decisions based on how they align with that value. I don’t have a business, but I think that concept works perfectly applied to life. Then I found The Desire Map, a book about making goals based on how you want to feel rather than picking the goals and hoping they get you to the state of mind you want to be in. Similar to Tara Swiger’s North Star, you decide what feelings you value most, write them down so you think about them often, and make all of your decisions based on whether or not they get you closer to those feelings. And yesterday, I found this book, The Crossroads of Should and Must: Find and Follow Your Passion *, bought it and read the entire thing by the end of the day. This book is written by Elle Luna, an artist who decided to follow her calling to paint rather than what she (and/or others) thought she ‘Should’ do. The gist: every day we can choose to do what we Should do (pressures from society and other people) and what we Must do (the thing that we really love to do, that we were born to do). Out of all of the books and blogs I’ve found on the topic of finding your passion, this one has spoken to me the loudest and I think because it has no “how to make money from your passion” angle. Elle’s stance on it seems to be you either follow your passion or you don’t – it can be on the weekends, 10 minutes a day, or you can quit your day job and spend all day doing it. If it’s truly your passion, you not only won’t mind carving out 10 minutes a day for it, you won’t be able NOT to. She covers how to get around road blocks you might think you have: money, time, space. As well as how to become aware of what your Shoulds are, where they came from and why you think you need to do them (so you can stop being a slave to them). This is something I’ve slowly started to do on my own in the past 6 months as I’ve become aware of these things — like realizing that a functioning member of society isn’t necessarily someone who makes money, having a job in itself does not add to your own value, or that things you do outside of making money can add to the world immensely. She also gives some tips to inspire you to figure out what your Must is, if you don’t know what it is yet. I started setting up a little corner in my office for figuring this out. 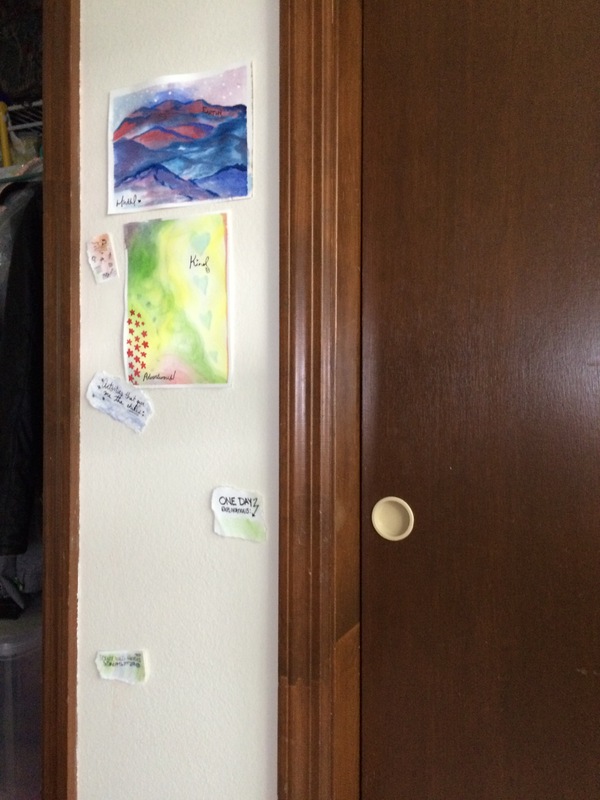 I did a few little watercolor paintings, then wrote four feelings I want to strive for (based on the Desire Map). And I’ve actually heard about this one before, but she also suggests you write your own obituaries – one written based on where you’re headed now and one written based on how you want your life to go. Then you post all of this up somewhere and start looking for the patterns. You’ll find that you gravitate toward certain activities and things, towards group activities or solitary… Maybe you tend to stay inside when you’re doing things you love or you just have to be outside to feel ‘right’. Keep opening yourself up to new things and see where they connect with what you already love. Eventually, you’ll find your Must. If you’re still trying to figure yourself out, I suggest you give the book a read — buy it*, check it out from the library or watch the video below. I’m always hopeful that everyone will find their calling and follow it. A world full of self-realized people who do what they love seems like a world lacking in judgement and full of positivity. Strive high! Webstock ’15: Elle Luna – The Crossroads of Should and Must from Webstock on Vimeo. what ever dreams, life goals, or things you are passionate about, if it makes you happy…DO IT! money doesn’t buy happiness and everything else will keep you inspired to do more! for yourself and for others!